It wasn’t until this summer that I decided once and for all that pink is my favorite color wine. A bit embarrassed by my taste for easy-drinking rosé, I’ve stuck to super-crisp whites in the summer. And so, I know very little about rosé—the best makers, the proper prices, the connection between shade and taste or sweetness. I relied on the expertise of my local liquor store proprietor when I needed a special bottle for a gift recently. All I know is that I like it very cold and very dry and that it goes down very easily on a sultry summer night. But rosé is so hot right now, and no longer just among rappers and large groups of socializing 20-something girls. Rosé has become downright respectable. I’ve eaten at quality restaurants with wine lists featuring more rosés than articles I saw this year that discussed why Beyoncé is/isn’t a feminist. So I’m coming out: I am a rosé lover; I drink pink! I often gravitate toward the compromise: chocolate-vanilla swirl soft serve on a cone, rarely vanilla or chocolate alone; half smiles in photos, never a rested face, never teeth; the grey shirt, not the black or white one. Mix red and white and you get pink. Rosé is a summer wine, so it pairs beautifully with a lot of summer fruits: raspberries, strawberries, apricots, etc. I had been dreaming of it with nectarines and peaches. Not any nectarines and peaches; yellow ones are a bit too literal—I love their flavors, but they’re too bold. They’d overwhelm the blush wine. I wanted to use floral, honey-flavored white peaches and nectarines (the white nectarines are more bitey than the peaches). In this refreshing sorbet, the flavors of the fruit and the wine are both round, bright, and present. 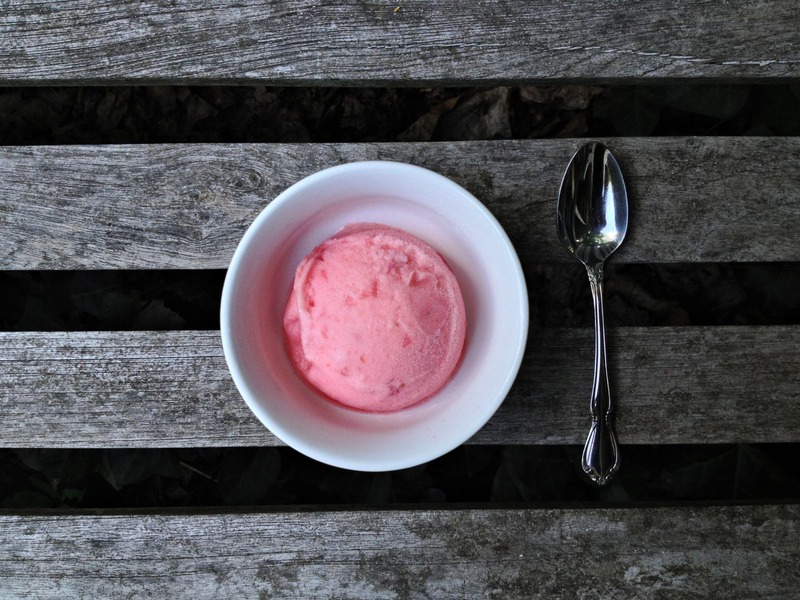 The creamy strawberry-ice-cream-pink sorbet might just be better than the ice cream it resembles. Topped with a lightly herbal thyme-infused whipped cream, it’s just worked enough to feel like a dessert, yet it tastes so fresh that, if you close your eyes, you can easily imagine yourself simply eating juicy, ripe fruit over the sink out of hands scented by the thyme you were cooking with and with rosé-stained lips and teeth. I went back to the liquor store to pick up that rosé I had purchased as a gift so I could try it for myself, and I was not disappointed with the recommendation. 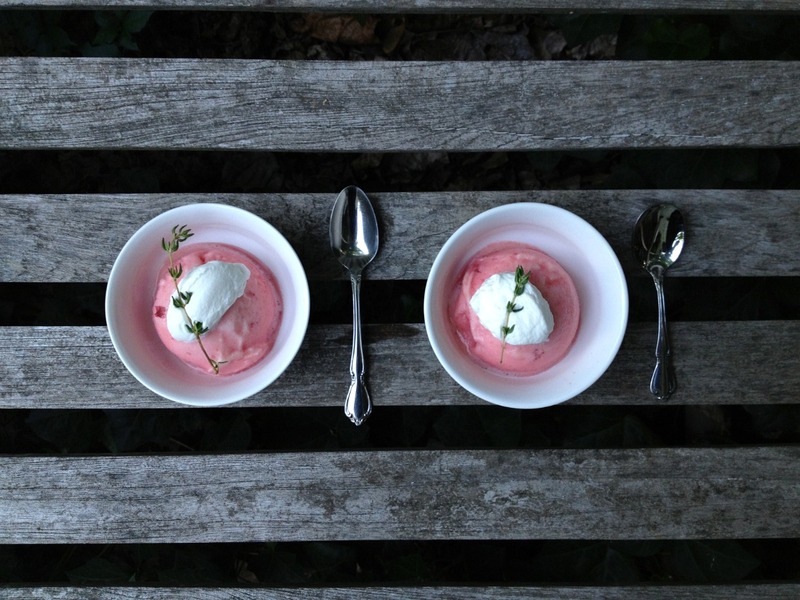 If you’re using a rosé you really love, might I suggest pouring it over the sorbet, whipped cream, and some berries or other fruit and making a float? I guess I don’t have to ask. But while the floats are a fun flourish, the sorbet itself has beautiful rosé flavor and can easily stand alone. If you’re not convinced about rosé, take a sip of the liquid after simmering the peaches and nectarines; the fruity, wine-y elixir is concentrated bliss. Pink isn’t my color, but it sure looks good in my glass and in my bowl. 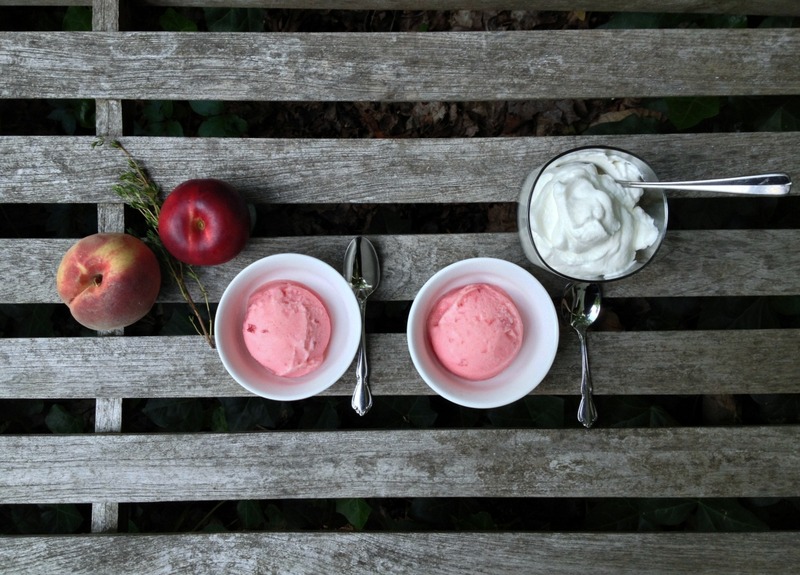 I prefer to leave the nectarine skins on, because they add complexity of flavor and a pleasant speckled look to the sorbet. I peeled the peaches, but, shhh, I only ever do it with a peeler because that blanching business is too tedious for me. If you’re using yellow stone fruit rather than white, substitute the ¼ cup of water for ¼ cup more rosé. Do the same if you’re using all nectarines. This dessert has some tang. Using all peaches will result in a much sweeter sorbet, which would be different, but still good, I’m sure. You may need to reduce the sugar but this will have textural effects. I really prefer the flavor created by using half peaches and half nectarines. I used a technique I learned from the Cook’s Illustrated recipe for Raspberry Sorbet in which part of the sorbet base is quick-frozen and then melted back into the bulk purée to initiate the formation of smaller ice crystals. I was extremely pleased with the results, but I can’t be 100% sure the superior texture of this sorbet is due to that technique since I’m using a large amount of alcohol. 1. Combine peaches, nectarines, rosé, sugar, water, and salt in large saucepan. Bring to boil, then reduce heat to medium and simmer, stirring occasionally, until fruit is cooked but not mushy and liquid is a bit syrupy, 15 to 20 minutes. Let mixture cool until just warm, 20 to 30 minutes. 2. Process fruit-rosé mixture in food processor until completely smooth, about 1 minute. Transfer purée to large bowl; transfer 1 cup from large bowl to small bowl. Refrigerate large bowl and freeze small bowl for at least 4 hours or up to 12 hours. 3. Break frozen base into a few pieces with spoon and transfer to large bowl of base. Stir occasionally until melted and mixture is completely smooth, about 15 minutes. Stir in lemon juice, if using, and remaining 1 tablespoon rosé and churn in ice cream machine just until thickened and lighter in color, 15 to 20 minutes (do not overchurn). Transfer mixture to container and freeze for at least 3 hours before serving with thyme whipped cream, if using. Sorbet tastes freshest within 1 to 3 days. 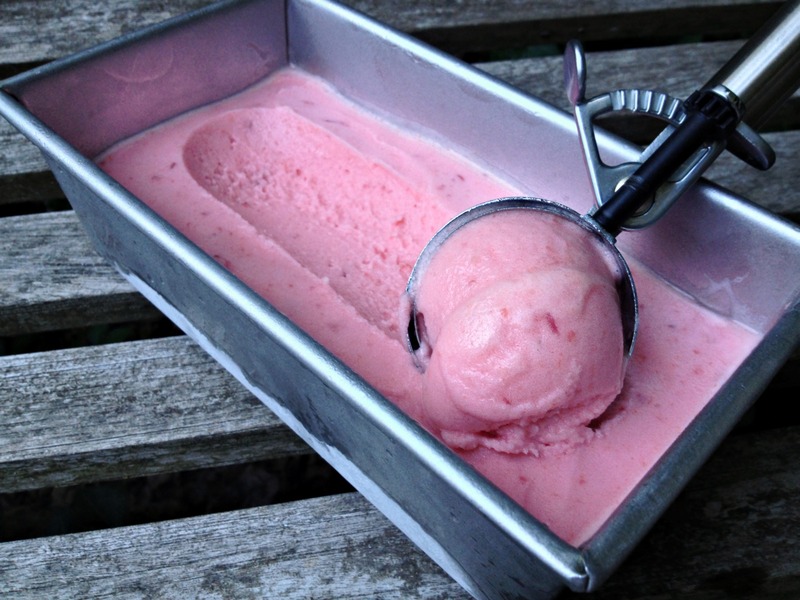 If not eaten after 24 hours, sorbet should sit at room temperature for 5 minutes before being scooped. 1. Combine cream, thyme, and salt in small saucepan. Scald over medium heat, cover, and let sit for 30 minutes. Transfer mixture to airtight container and refrigerate for at least 8 hours. 2. Strain cream mixture through fine-mesh strainer over bowl of stand mixer. Whip until soft peaks form. 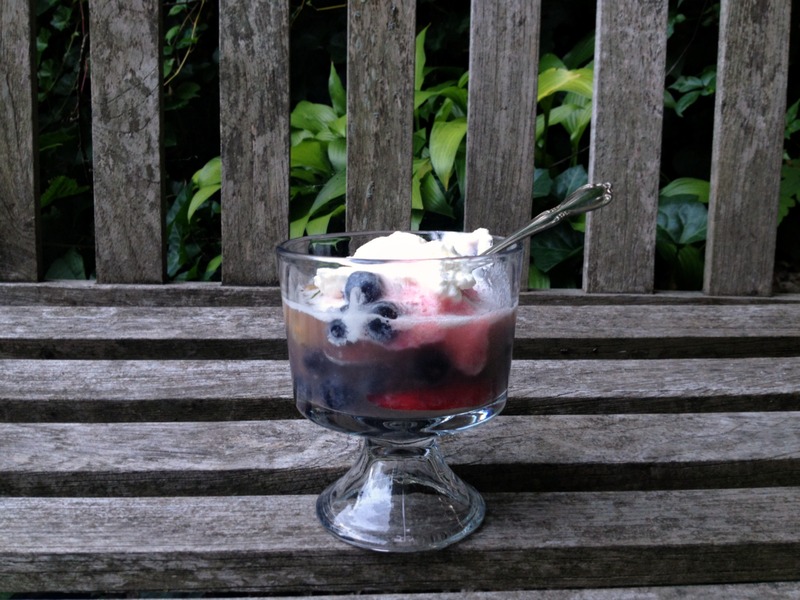 this sounds absolutely delicious and what a great summer treat! I drink pink too! I can’t get enough rose during the summer. The Wine Bottega had a tasting a couple of months ago, and I found an Austrian one I really love. I’ve got quite a stash to get through before the cold weather and my Malbec cravings set in. I love the idea of a rose float. I love rose (and anything pink, which is hands down my favorite color). I think making a rose float is a wonderful idea! There’s something very cheery about eating something pink, isn’t there? There is absolutely nothing wrong with a good rose. I always serve it at Easter! But did all of the color of your sorbet come from the wine? It’s so so pretty. And sounds deivious!!! Thanks! I leave the skins on the nectarines, plus the flesh, especially near the pits, of the white peaches and nectarines has a blush hue, so both the skin and flesh contribute to the super-pink color as well. This sounds so amazing! I’m alcohol intolerant but I think I can try this with an alcohol removed wine. Not as fun but I’m sure just as pretty (and tasty)! Hi, Nicole. Please do try the recipe with the alcohol removed wine and tell me how it comes out! But I cannot guarantee that you’ll get a creamy ice-free product given that only alcohol has the properties that keep the sorbet smooth. You may find you need to add more sugar or less overall liquid to get the best texture. I hope you experiment!